It was ten minutes before 10a.m., almost time for the Great Clock Tower Show in the lobby of Great Wolf Lodge. I looked around me, checking off a mental roll call of our crew: my husband, Aaron, our 10-year-old daughter, our two boys—ages seven and 13—my 60-something parents, and—wait. My mom disappeared down a hallway to find my 85-year-old grandmother and emerged slightly out of breath several minutes later with Grammy in tow. The family matriarch was decked out in a purple track suit with red sweatbands around her forehead and wrists. Mom had found her in the Iron Horse Fitness Center. Aaron, the kids and I had visited Great Wolf Lodge before, but never with an entire multi-generational entourage. Despite feeling a little overwhelmed keeping track of everyone, I knew a long weekend in Kansas City, KS would be the perfect way to celebrate some quality extended family time. “It’s starting,” Jonah, my youngest, whispered as he tugged on my sleeve. Gorgeous rustic architecture, a massive fireplace and woodland creatures posed in such lifelike stances that you wonder for a split second whether they’re real fill the Grand Lobby. But the highlight for Jonah—and me, too, if I’m being honest—is the Great Clock Tower, a fantastical clock that brings to mind images from a Dr. Seuss book, but with a wild Northwoods twist. It incorporates forest friends that come to life with songs, stories and jokes that had even my 13-year-old, Lucas, cracking a smile. The Great Wolf Lodge grand lobby in Kansas City, KS is home to the Great Clock Tower, a fantastical clock with forest friends that come to life with songs, stories and jokes. When the show ended, we huddled up to decide what to do next. We had spent the entire previous day at the lodge’s massive indoor water park, swimming, sliding and splashing our way into the weekend. Today we wanted to stick to dry land. “The arcade!” Aaron and Lucas shouted in unison. Lights flashed and bells dinged as we stepped into the Northern Lights Arcade. My mom whispered to me that she and Grammy were slipping out to pick up some souvenirs at the gift shop, and my dad took the kids over to the air hockey table. Aaron and I realized we were suddenly alone. “Are we … kid free?” he asked. “Built-in babysitters are one of the benefits of big family vacations,” I said with a sneaky grin. A couple hours later, we walked out of the arcade with three giant stuffed animals and a very happy family. That evening, Grammy had a surprise for us all—tickets to a roller derby bout. 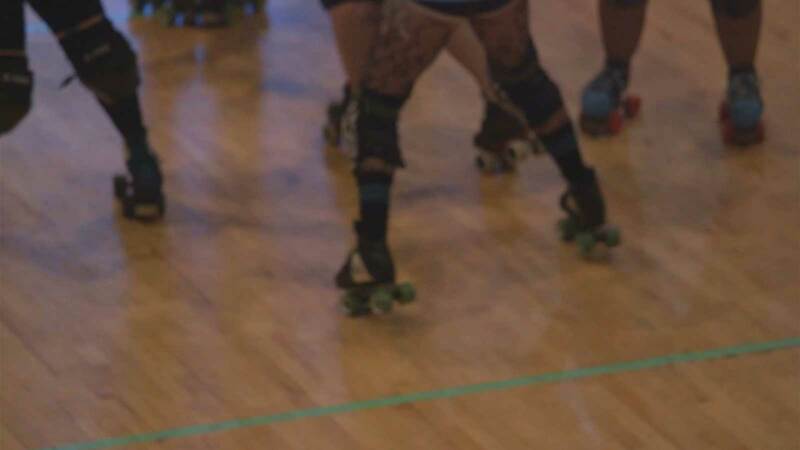 The Kansas City Roller Warriors are one of the original members of the Women’s Flat Track Derby Association and have been important in growing roller derby as a sport. The Black Eye Susans faced off against the Victory Vixens, and these gals didn’t mess around. Their speed, fierceness and overall confidence on the track leave quite an impression. Both teams clearly had an avid fan base, and the cheers echoed loudly throughout Memorial Hall. The Kansas City, KS Roller Warriors roller derby team are one of the original members of the Women’s Flat Track Derby Association. My daughter, Emmy, was mesmerized. “I want a pair of skates,” she announced, her voice filled with awe as she watched the women fly past us. Aaron took out his phone and started searching for junior roller derby leagues near our hometown. Afterward, several of the women were kind enough to stop and talk to Emmy. They even took her out onto the track. As we left the auditorium, Emmy hugged Grammy and thanked her for the tickets. My dad grew up on a farm and has a great affection for all things agriculture. So there was no way we were missing out on an opportunity to visit the National Agricultural Center and Hall of Fame. He was giddy, and his enthusiasm was contagious. “Papa, did you ride tractors like this one?” Lucas asked as we walked past a giant red tractor. “Living on a farm is awesome!” Lucas shouted. A replica one-room schoolhouse is a highlight of the exhibits at the National Agricultural Center and Hall of Fame in Kansas City, KS. Though getting up early may not have been fun, my dad spent the day reliving his childhood and entertaining the kids with stories about slopping the pigs and showing cows at 4H. The museum holds everything from antique machinery to a one-room schoolhouse and an authentic 1890s farm home that was reassembled board by board as a tribute to the pioneers. My dad’s face shone with pride as the kids asked questions about farming and took a genuine interest in learning more. I even learned a thing or two myself, and I’ve been hearing his stories my entire life! 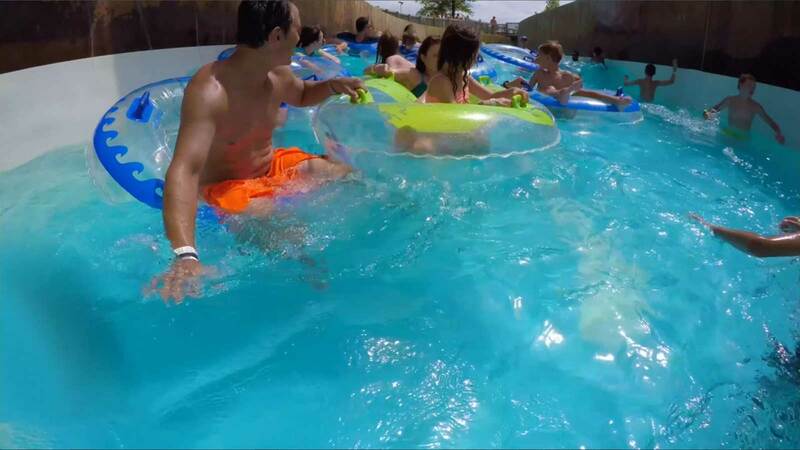 For our final day in Kansas City, KS, we went back into the water, this time at Schlitterbahn Waterpark. From its lazy rivers and surfing waves to its speedy slides, our family found something for literally each one of us. Grammy, while athletic for her age, is not a fan of heights. But the lazy river suited her perfectly, and she got to spend that time with Jonah, who doesn’t like heights either. The rest of us tackled the slides one by one. This wasn’t my first trip to Schlitterbahn, but it was my first time riding the thrilling Storm Blaster—an uphill water coaster. I begged my parents to ride it with me, but it took Lucas asking before they would do it. Grandkids can get away with anything! From its lazy rivers and surfing waves to its speedy slides, the Schlitterbahn Waterpark in Kansas City, KS has something for visitors of all ages. We reunited with Grammy and Jonah at the Boogie Bahn. Jonah crushed it, surfing those waves like a pro, while Grammy cheered him on. The wide grin on his face reflected the mood of the whole family. It had been an exciting weekend filled with fun adventures and family bonding—exactly what I had hoped for.